On the 13th of March, 2017, NALSAR University of Law hosted Justice K. Kannan - Former Judge of High Court of Punjab & Haryana, Chandigarh and High Court of Madras and the present Chairman of the Railway Claims Tribunal at its Principal Bench at New Delhi. 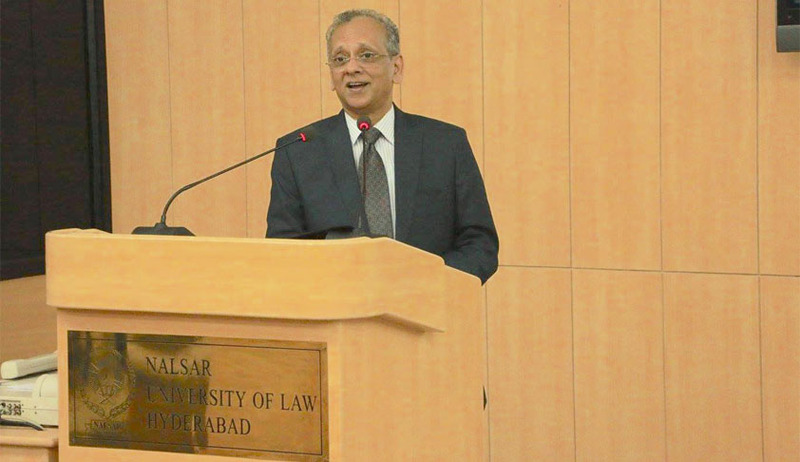 Justice Kannan, at the invitation of Nyaya Forum for Courtroom Lawyering delivered a talk on his career in the judiciary titled ‘Judging: A Spiritual Journey’ to a gathering of students and professors at the MK Nambyar SAARC Law Centre. Justice Kannan also taught a week long credit course on Comparative Succession Laws to NALSAR students. Justice Kannan, shared his experience as a web blogger, where he critiqued various judgments and raised several unpopular questions fearlessly in interest of general public. He was one of the most prominent blogging judges but after a starred question was raised in the parliament on issue of blogging by a judge and criticism from amongst the judging community, he had to withdrew the blog. He said that his pre-occupation as a lawyer was getting at the truth and as a judge to closely inquire about what is the truth there. Recalling his experience as High Court judge, Justice Kannan talked about the dilemma of being in congruence with the superior court orders, where he had to look for voices within to secure justice. He advised that if you probe little more, you can get all the answers to arrive at the truth. As a judge in criminal cases, he took the onus upon himself to point out the untruth, though he admitted that getting at truth in criminal trial cases has its own limitation. He spoke about various lacunae in law which need to be amended and encouraged students and academic community to engage in critical debate and discussions surrounding these issues. He highlighted some of the areas which require attention such as relevancy of the concurrent list and how to make it purposeful; abrogation of S.306 of Indian Succession Act; lacunae in welfare legislations. He said that tort law is crying for attention and students should be able to raise issues for discussion. He referred to Kerala which has made great advances in legislating tort law. He condemned the evil practice of honor killing and was hopeful that the issue of caste can go only with people of the young generation who would look beyond caste. He recollected how he encountered a case where two youth had eloped in search of love and how they had to seek the High Court’s protection. The hope of getting rid of caste is alive in the form of the budding young generation. He shared that in his judgments he gives ideas to be explored by young people. Justice Kannan strongly recommended that students should write short critique on judgments in magazines/ journals, as there are serious flaws in judgments which go unchallenged. He said that as a judge, one must be susceptible to the fact that there could be judgments which go “wrong.” He said that he is no romanticist of the judicial process. He also mentioned that not many judgments which change the law gets highlighted in media. He said that critique should come from the academic community. Further, he advised students that there is no way of understanding laws better than by writing about it. As a former editor of the Madras Law Journal, he also shared with students best ways to write and get works published. Justice Kannan, concluded by stating that as a judge, for him spirituality, is being transparent, truthful and evenhanded. Entry into litigation is a spiritual cause and it is perfectly possible to be truthful, as law and truth are perfectly compatible.